Tire out-of-balance is usually in the tread area (A), see illustration below, since the tread is the heaviest part of the tire and the part farthest away from the center of the axle. In the illustration, (A) represents the heavy spot; in the example let's say it is 5 ounces. (B) is the area of the rim where weights are usually applied. (C) is the center of the axle, (D) is the diameter of the rim, (E) is the diameter of the tire and here we are using a 34 inch diameter tire for the example. Area (A) is 17 inches away from the center of the axle (a 34 inch diameter tire divided by 2 equals 17 inches) and area (B) is 7-1/2 inches away from the center of the axle (a 15 inch rim divided by 2 equals 7-1/2 inches). In this illustration the 5 ounces of imbalance is far out from the center of the axle (17 inches) and an attempt to balance the assembly will require putting weights on the edge of the rim which is much closer to the center of the axle (7-1/2 inches). To balance the tire in this example by placing weights at point (B) to correct the 5 ounces of out-of-balance at point (A) will require considerably more than five ounces of weight to bring the tire into balance. These figures will change depending on the number of ounces of weight a tire is out of balance and the diameter of the tire in relation to the diameter of the rim it is mounted on. In this particular example the amount of weight required to bring this 5-ounce out of balance into balance with the tire mounted on a 15 inch diameter rim would be 10.6 ounces. The 'taller' a tire is and the 'shorter' the rim is the more weight it takes to bring the assembly into balance. Even more weight is required when using the stick-on type of weights applied to the drop center part of the wheel because the weight is being applied even closer to the axle. This is sort of like a 200 pound kid trying to seesaw with a 100 pound kid...it just does not work unless the heavier kid moves closer to the center of the board. 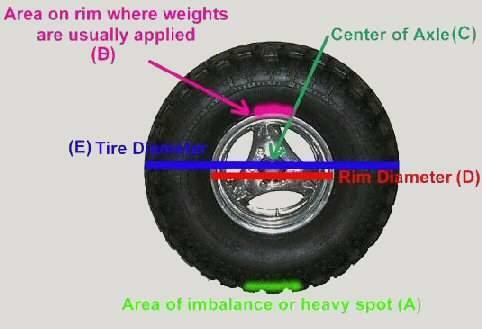 The best way to overcome this situation is if you were to determine the heavy spot of the tire (in the illustration it is 5 ounces) before it was mounted and place a 5 ounce internal "balance pad" or "dough compound" directly opposite the 5 ounce heavy spot by gluing the 'balance patch' to the inside of the tire which would be placing the 'balance patch' (weight) very close to the 17 inch radius from the center axle point it would require only about 5 ounces of 'balance patch' to properly balance the tire. After this would be done and the tire mounted on the wheel the entire tire and wheel assembly could be put on a balancing machine to correct for any imbalance in the wheel itself or some minor dynamic imbalance that may be present. None of these procedures will give satisfactory results if the rim is warped or has too much run-out to begin with. We hope this information helps you in understanding some of the factors involved in proper balancing and that a tire is never 'out of balance' as much as the number of ounces of weight required to 'balance' it using conventional balancing equipment. There are two major factors that influence the amount of weight it takes to balance a LT tire as compared to a passenger tire. These two factors are: Outside diameter (OD) and tread mass. First, the outside diameter or the “height" of an LT tire is much greater than that of a typical car tire. The average car tire is around 25" in height or OD. Compare that to the light truck tires that can go as tall as 54". For the sake of this example we'll say the average is about 37 inches. Using this for comparison, the height or diameter alone of the LT tire puts it roughly 1.5 times higher than the car tire. This of course converts directly into MORE balance weight (remember the see-saw effect discussed earlier) when all else is equal. Unfortunately that is not where the differences end. The LT tire also has much more material around its outside diameter than the typical car tire. The amount of materials varies greatly by size, but it is safe to say here that the typical LT tire has 4 times more mass (material) than your everyday car tire. Think of the deeper, wider tread, the wider and thicker steel belts as well as the nylon caps and all the other larger pieces required to make the LT tire. Remember also that the larger diameter means longer lengths of all those components too. All those larger pieces combine to make it 4 times heavier. We described earlier how the weight at the tread surface is a product of the tread's distance from the center. 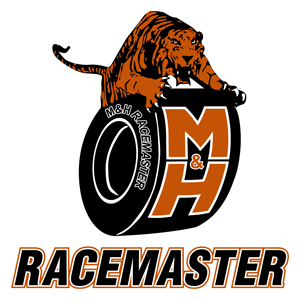 Using the diameter and mass difference (1.5 x 4) combine for a 6 to 1 disadvantage for the average LT tire. Put it another way: if the radial car tire takes 2 ounces of weight to balance, the LT tire would take 12 ounces if all else were equal. The discussion up to now has really only discussed balancing tires on a static or bubble balancer. The most common type of tire balancing used today is dynamic or spin balancing. The easiest way to imagine how this works is to think of the tire as if it were split right down the middle of the tread. Imagine having two saucer shaped pieces. The dynamic or spin balance machine balances each of those halves or “saucers" separately. That is why the typical spin balanced tire will have different weights at different locations on the inside and outside of the wheel. The static or bubble balance is a combination of both saucers, dynamic separates the two pieces. Spin balancing is regarded as the best way to balance a tire and wheel assembly. There is however some practical limitations here as all tire shops and garages do not have balancing equipment that can handle the larger light truck tires. If the equipment is not available to spin balance the larger tires, then the next best thing is to use the static method as described before. This will not give you the optimum balance job but is acceptable. Remember if you use tape-on weights it will take more weight the closer the weights are to the axle and you will not get the full benefit of dynamic balance if you do not have balance weights on both sides of the rim. Regardless of the balancing method you choose always keep in mind that if the wheel is out of round or warped the ride will still be rough. The balance and ride quality of a tire is often affected by the run-out and quality of the wheel...the wheel and the tire are an assembly and work together as such. When the balance weight seems high it is often helpful to simply break down the tire from the wheel and turn it 180 degrees. The balance numbers will usually come down a bit. Use the valve stem as a reference point. The ride quality of a tire and wheel assembly is dependent upon many factors, only some of which have been discussed here. The options we have discussed are intended to give you greater understanding of how some of these factors work and what can be done to achieve the best possible ride.